You know, some people are just blessed from the time that they are born with beautiful thick hair. My niece is one of them, and my friend Laurie has three of them. I remember when Little Londynn was born. She is three weeks younger than my Spunky. She was born with gobs of gold hair that never fell out (lucky Laurie)! While my Spunky was resembling Mr. Clean and making do with brain squeezers, Laurie was able to put cute clippies and bows and piggies in her daughter's hair. Not much has changed. Londynn has super thick hair that makes me drool. 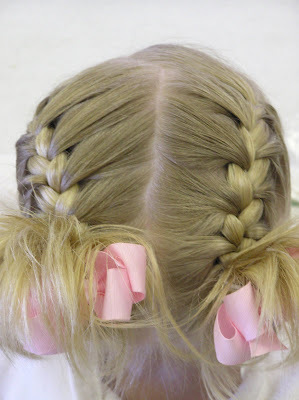 Here is one of the super cute styles that Laurie does to her hair. Thanks Laurie for your submission! Keep them coming! Part the hair first. Laurie parted it on the side and then once she got to the crown she took the part over to the middle. French braid down the first side. When you get to the part of the braid where you no longer have any hair to braid, this is where you end the braid. Use your elastic to pull the braid through. When you get to the last loop, only pull the hair 1/2 way through. Then put a ribbon or bow on the ponytail For super thick hair like Londynn's, a clip bow would probably stay in if you found the right place for it. For my dd's thinner hair, I would tie a ribbon around the elastic. Then take your flat-iron or your curling iron and spike out the ends. Spray the hair.